Rich vegetation. Bushes, cacti, and yuccas. Flood plains, canyons, and mountains. Best yet, you don't need to visit multiple destinations to see such variety. As the Rio Grande winds along the Texas-Mexico border, it creates a giant horseshoe known as the Big Bend. And at the southern tip of that horseshoe, you will find one of the wildest and surprising national parks located in such a remote area. 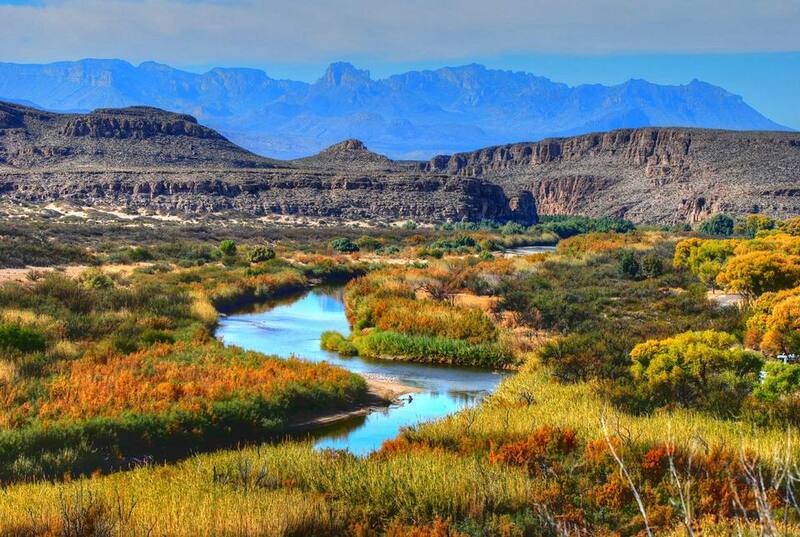 Big Bend National Park was established in 1944 and holds a rich history of visitors, plants, and animals. People have passed through the land for over 10,000 years including the Apache, Spanish conquistadores, U.S. soldiers, miners, and farmers. Today, visitors can learn about over 1,200 species of plants, some so rare they cannot be found anywhere else in the world, as well as more than 450 species of birds—more than any other national park in the U.S. With so much to learn about, it's easy to fill up each day of your visit with exciting and engaging activities. But what can you do with just one day? Find all the can't-miss attractions and trails for your one-day adventure. Start the day at the visitor center at Path Junction, but beware; once you see how many trails and sights there are to explore, you may want to stay a few extra days. In any case, grab a bagel and coffee and begin with a 50-yard nature trail known as Panther Path. This will provide an excellent introduction to the plants you are about to see. Be sure to check out the Chisos Mountains, located behind the visitor center. They are the southernmost region in the U.S. and a stunning sight. Hop back in your car and take a left out of the visitor center, then left at Basin Junction. Let the day begin! The first sight to take in is known as Lost Mine Peak. You will pass this jagged summit as you drive. It's told that Spanish explorers discovered a silver main near the summit and enslaved Native Americans to work at it. The workers killed their masters and sealed the mine's entrance so it would be lost forever. Drive on and you will see Casa Grande, which means "big house," and is one of the largest landmarks of the park. As the road climbs higher into the mountains, you will pass through a canyon known as Green Gulch. This is when the vegetation begins to change from desert to grasslands and woodlands. The Chisos Mountains create a cooler and moister island in the desert which helps oaks, pines, and junipers grow. After about five miles you will come to the road's highest point—Panther Pass—at 5,770 feet. It is named for the mountain lions common in the hills. But don't be alarmed, this is actually a good time to get out and stretch your legs. Park the car and set out at the nearby trailhead for the Lost Mine Trail—a self-guided nature trail that even has an informative booklet. The trail is 4.8 miles roundtrip and can be strenuous at times, but it is so worth it. If you really are short on time or energy, you may choose to hike the 2-mile roundtrip trail to Juniper Canyon Overlook. Keep the camera handy for shots of amazing vistas of the wooded Juniper Canyon. Window View Trail: Easy 0.3-mile roundtrip showcasing a window-like opening in the mountains. The Window: A more challenging trail to the window itself with amazing views of Casa Grande. South Rim: A moderately steep 13-mile round trip that reveals the most popular and unforgettable views of the park. After 4.5 miles you will see Boot Canyon—an oasis of ​trees and home to gray and yellow Colima warbler nests on the canyon floor (not found anywhere else in the U.S.). It's up to you what you have the energy and time for. Try to keep the hikes short if you want to continue to see more of the park. By now you're close to the Santa Elena area of the park, which makes for a wonderful scenic drive. You may choose to spend the rest of the day driving the 10 miles and taking in the overlooks and sites along the way. But you have the time to squeeze in more so only stop at the scenic overlooks you really want to. Be sure to check out the old Sam Nail Ranch where you can stroll through remains of windmills and a ranch house. The drive will lead to Cerro Castellan which rises 1,000 feet up. Turn left here into Castolon and walk around an old Army post that was built after the 1914-18 border troubles with Mexico. There you'll find a handy visitor center with exhibits and a bookstore. It's a good place for a lunch break and rest stop. If you're up to it, drive the Panther Junction towards the Chilicotal Mountains. Look for a turnoff for hot springs and remember it will be a bumpy ride. The reward? Native American pictographs on the cliffs along a trail to the springs. The main road will lead to the Rio Grande Overlook, which is amazing, and eventually to the Rio Grande Village. If you are a bird watcher, this is a must-see. It is a great place to watch the sunset and end your day. By the end of the day, you will probably feel exhausted. Big Bend National Park offers so much to see and do. Besides scenic drives, overlooks, and hikes visitors can enjoy fishing, river-running (permit required), cycling, workshops, and evening programs. Your one-day visit just may lead you to come back again and again!